Bellevue College seeks to reduce waste through reducing consumption, reuse, and diversion from the landfill. The Bellevue College cafeteria offers some organic and fair trade offerings, including coffee, all served on compostable materials (read more about Sustainability in Foods Services). Nearby, the student garden offers students opportunities to get their hands dirty. Cafeteria waste oil is sold for the production of biodiesel, composting is picked up by Cedar Grove, and recycling is promoted to divert refuse to alternatives. The bookstore has banned plastic bags. 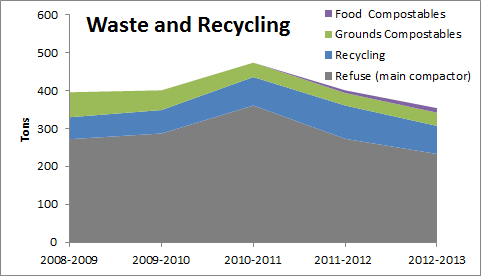 The total amount of waste keeps falling, while increases in composting play a role in decreasing refuse, overall disposing of goods seems to be falling.